When faced with a big neighborhood sale with many streets to cover, I sometimes resort to the “drive-by” technique. This well-honed practice has me slowing down to a crawl in my truck, then giraffe necking while attempting to gander from a distance at the seller's stuff. It’s a time efficient, but risky technique since you can’t always see what might be hidden in a driveway. Last Saturday, I was executing my best drive-by when I noticed a seller with a huge amount of promising stuff in her driveway. As such, I deemed the stop “worthy” and pulled over to take a closer look. Walking up the driveway, I spotted a Kelty Kid’s carrier. These carriers are pretty high-end kid gear and cost big bucks when new. Eyeing it over, I asked the seller, a grandmotherly type, how much she wanted for it? She threw it right back at me with the overused, “make me an offer” response. It’s a pain when a seller won’t get the ball rolling and just name a price. When they don’t, they probably regret asking me to start the dance because I usually low-ball them. In this case, I decided to offer her a whopping five bucks for the Kelty Kids carrier. Naturally, she countered at ten bucks. Looking over the kid carrier a bit more, I commented that I had to be careful because I was under strict orders not to bring big, bulky stuff home. (A fact more or less true, since Mrs. Dude and I are trying to downsize in preparation for an eventual move.) This seemed to hit home with the grandmom and she quickly changed her tune, blurting out, “Okay, I’ll take five”. 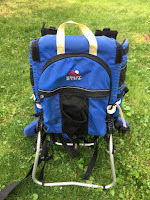 The next thing I knew, the big, bulky Kelty Kids carrier was heading home with me. Although it really was big and bulky, I didn’t need to worry about it taking up space in my garage. I posted it on Craigslist that afternoon for $35 dollars. By Tuesday it was sold. A thirty dollar profit for something I stored in my garage for only three days! I wish they all went that easy and quick. Would Joanna hang this up? Speaking of downsizing, the saga continues for Mrs. Dude and I. In a recent excursion into my attic, I hauled down a large box of household items that had been packed away for many years. The box turned out to be a veritably Eighties time capsule, containing household decorative type stuff from our first home. Among the odds and ends was this neat poultry feedbag. This old feed bag brought back some nice memories for me. Long before Joanna Gaines of HGTV's, “Fixer Upper” decorated in her farmhouse country style, a lot of people, including us, were doing the Eighties version. If you were around back in the Eighties, you might remember that earlier farmhouse look. Instead of current color schemes of black, grays and shiplap, it was powder blue, white and stenciling....lots of stenciling! In our first house, Mrs. Dude had me slapping powder blue paint all over our kitchen, including the cabinets and wood trim around our windows. She then went crazy, stenciling decorative country borders on the walls, lamp shades and pillows. This Eighties farmhouse look was completed with some neat accent pieces, including the poultry feedbag. I liked it and even though we lived in a row home near a big city, our little place could pass for a farmhouse in Iowa. Even now, I would have no problem hanging that feedbag back up on the wall. (Neither would Joanna Gaines for that matter.) But alas...that was then....and this is now. That little country kitchen was three houses and thirty years ago. Today, Mrs. Dude has no love for the old poultry bag, so with her say-so, it went on eBay. Seven days later, the feedbag sold for $35 dollars. If by some miracle it ends up on a wall on HGTV's Fixer Upper, I’ll be sure to say, "I told you so" to Mrs. Dude! Moving on, I am noticing a theme of $35 dollar sales, so let’s keep it consistent with this nice little find. About year ago, I headed to a garage sale held by a well-traveled and very affluent senior citizen. He too was downsizing, and if you had seen his huge house, you would know why. The home could best be described as a French style, mini-castle right down to a turret! His yard sale reflected the look of his castle, with lots of antiques, art prints and various other high-end stuff. 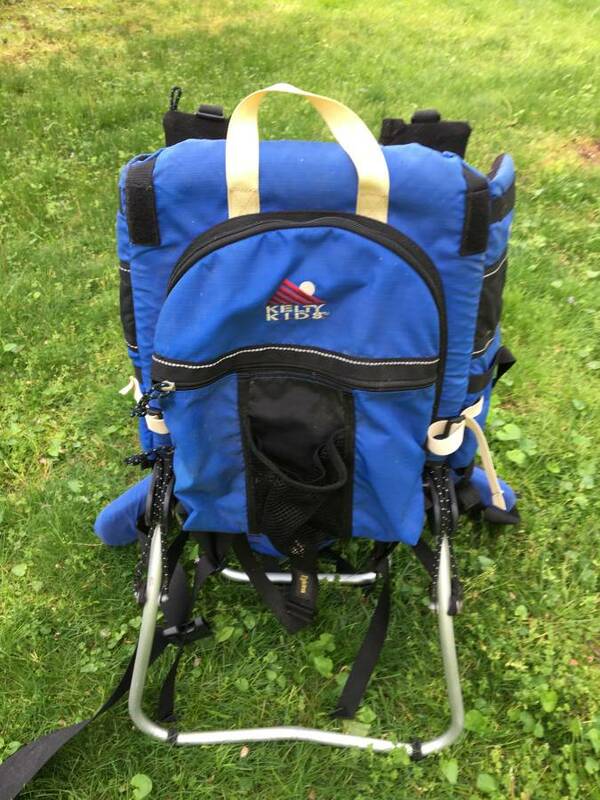 Included in this menagerie was a Master’s tournament portable folding chair. 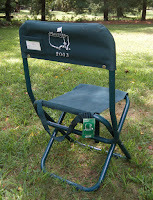 Each year attendees to the Masters Golf tournament purchase these light weight chairs to tote with them as they follow their favorite player along the course. Golf nuts will also buy on them on eBay. Interestingly, the year printed on the chair is also important to collectors. 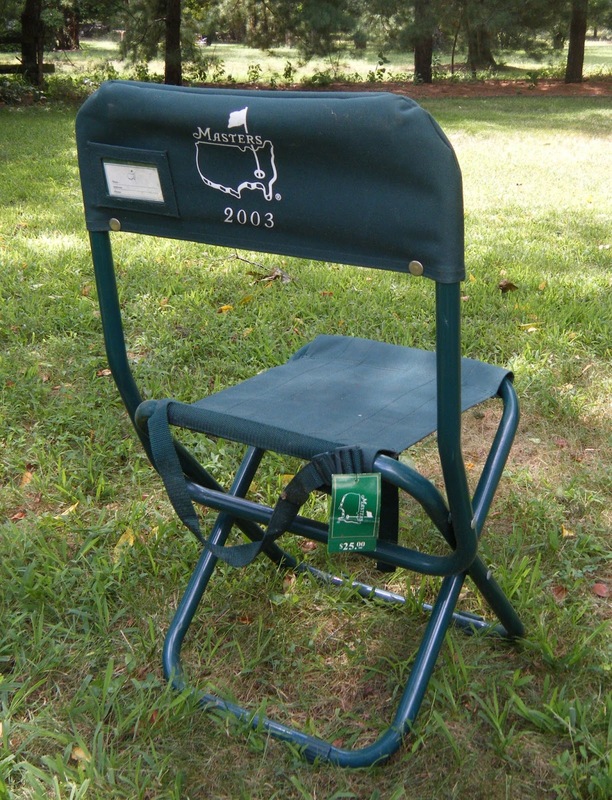 Fans like to buy chairs from the year their favorite player won the Masters. I’ve come across a few of these chairs in my garage sale excursions and will buy them if the price is right. (Usually five bucks.) This particular chair had it's original price tag still attached which always helps the value. I hoped to get the old-timer to come down on his price of $12 bucks, but he wasn’t budging. Since it's not every day you find a Masters Tournament chair, much less one with it’s tag still attached, I decided to pay him his asking price. Although I was starting at a higher initial investment, I still did okay flipping the chair. It sold on eBay for $35 dollars. After fees, this worked out to be about a twenty dollar profit. Not bad, but hopefully my next Masters chair will be snagged for the usual five bucks, instead of twelve.